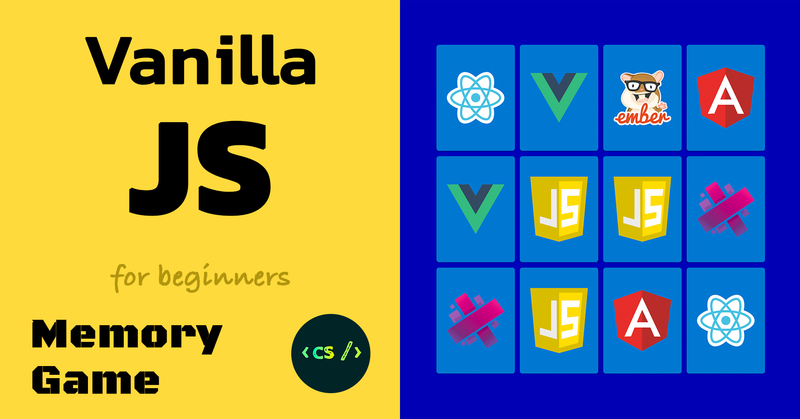 Learn basic HTML, CSS and JS concepts by building a memory game! I copied the assets into Hype and managed to make them work for the most part. Div classes / data-framework in inner html of elements. The script in full length + internal css in head HTML. In other words, my idea is to enable the launch of transition to the next scene or trigger another timeline in Hype after all pair of cards are flipped. From within the pre-made js- function. Any js-savvy help is welcome! Thank you, Danke @h_classen for taking your time and checking this! I trust your JS expertise. the code is mostly ok and runs in chrome and firefox and opera desktop. Thank you again @h_classen for your advice and tips, now I’ve got a lead! There is another way to approach this situation - it is not better - just another technique in the toolbox - that might come in handy on some other project. This approach is very straightforward but takes a bit of text to explain. We will be adding code just to the Head HTML and no where else. The reason I am showing this approach is this is how the original document was designed - the preponderance of the code that runs the show is in the Head HTML section. Sometimes when You are using a pre-existing document’s code it is advantageous to go with the flow. While utilizing Hype’s API in the Head HTML section is not intuitive (for a non-coder like myself anyway) it is easy to set up. The new code we are adding to the script in the “Head HTML” will track the number of sets successfully matched and when they are all matched - bingo - we go to the next scene (or what ever You want to do). This new code is commented~annotated as “NEW CODE” in the Demo. We will leave the "init" function as is. The line numbers sited are the line numbers in the “Head HTML” in the Hype project. All the NEW CODE is annotated~commented in the attached Demo. There is one major NEW CODE section in the Head HTML script that sets things up - the rest is just a few lines of code. One drawback with code in the Head HTML is that You can not use Hype’s API straight away as the Head loads before the rest of the document. BUT there is a work around using a callback routine which basically says “Hey! When ‘Hype’ loads run this script”. Inside this callback is a function that runs Hype API code e.g. Line 12 - find out the number of .memory-cards & divide the number of “cards” by 2 (i.e. 2 per set). Line 33: Set up a variable “cardSetMatchTotal” to track the number of sets. Line 66: If there is a card match > add 1 to “cardSetMatchTotal”. Lines 86-87: if “cardSetMatchTotal” == the numOfSets variable (line 12) then run the function expression stored in the "allCardsMatched" variable (i.e. sceneChange() > lines 15 & 16 above). thanks for joining, in this very case the party have just started. Thank you very much for your easily digestible comments and spelling out the code you rewrote for use in Hype. I feel more confident now in my guesswork with scripts. I am happy to see that the scene change works with the function you provided. when the scene transition happens. Otherwise I have to ‘shuffle’ cards manually for the next scene. I don’t understand much of advanced JS tech jargon, so I couldn’t comprehend author’s comment either : In order to invoke the shuffle function, let’s make it a Immediately Invoked Function Expression (IIFE), which means it will execute itself right after its declaration. I will have a look at this tomorrow (Feb 17) - if someone else doesn’t beat me to it. 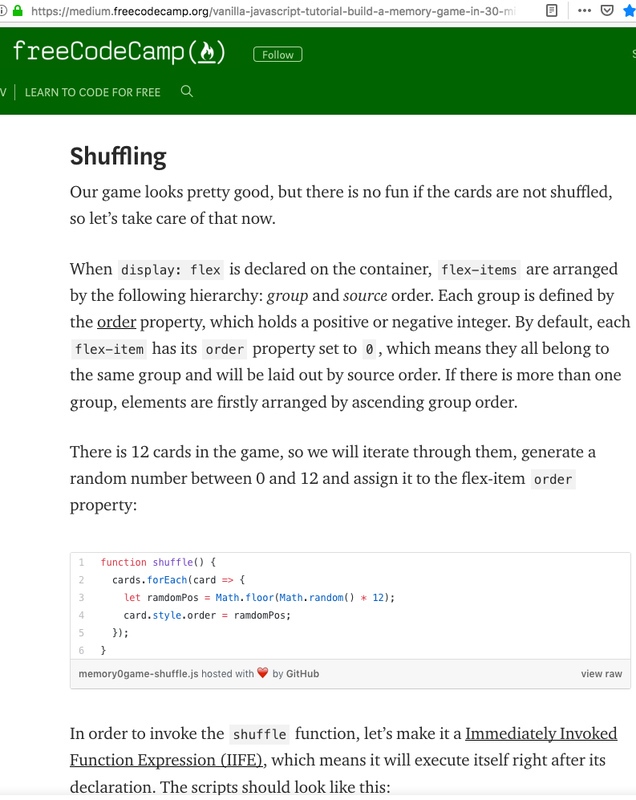 So I did a brief review of the “freeCodeCamp” page by Marina Ferreira that You linked to and soon discovered there is a “fly in the ointment”. 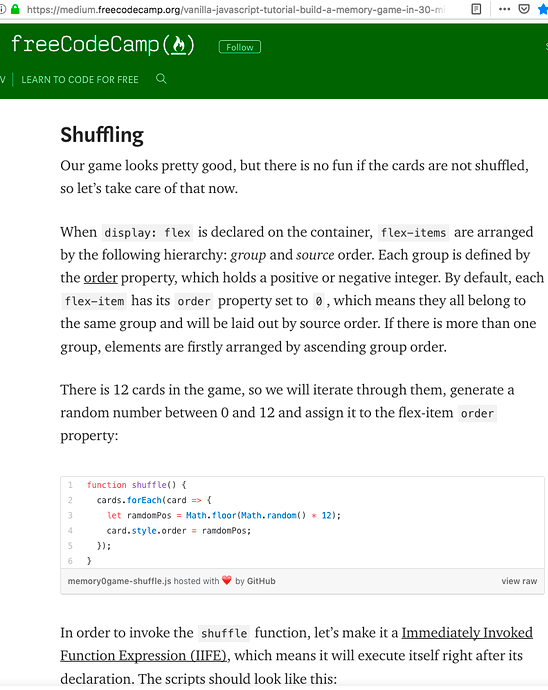 The shuffle routine depends on using a CSS flexbox grid. This grid depends on relative positioning. Hype uses absolute positioning. So we are swimming upstream here a bit. Here is a thread on this Forum regarding using flexbox. Attached just below is an example Hype project that @Did created and posted in that thread - pretty cool! Now You know as much as I do about flexbox in Hype. OR for these few numbers of card sets to match - a timeline could do the job - no significant scripting needed. Thank you @JimScott for investigating this and info on flexbox. In my case it’s a good solution to do the shuffling natively and visually in Hype with a timeline, no additional coding! It’s a hypesolution with template-approach that can easily be customized. a memorycard will be a group that wraps a top element and a motive-element. set classes like provided to those three elements in the document (memoryCard, memoryTop, memoryMotive ). further a element with class of ‘tries’ is needed. it’ll display the tries. hypes optimizing for used images has to be turned off. Very elegant solution, thank you @h_classen recht vielen Dank, Hans-Gerd! It is a must-have piece for hypedocks.com.